A lot of news about Plone and Zope. The main plone community web site. This site hosts Reflab free software/open source projects and activities. 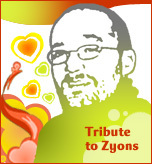 Web site dedicated to the python and Zope community, available in French. You will find there the translation of the Daily Python-URL from Pythonware. The Zope Zone has a lot of information starting with Zope and other news, discussions forums, a growing FAQ and many links that cover anything from Zope hosting to other Zope powered sites. Pilot Systems is deploying Zope and Plone open source solutions since 1999. Specializing in quality Zope based hosting, Pilot Systems is also the co-founder, hoster and maintener of Objectis service.